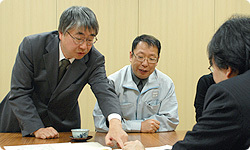 (flipping through the file in front of him) After we talked about New Super Mario Bros. Wii for “Iwata Asks,” I decided to see whether what we said was accurate or not. Oh, you dug up some old documents. Oh, wow! It’s got Miyamoto-san’s personal seal on it! It says “adventure.” Over the course of these few pages it doesn’t just talk about the overall structure of Zelda, but also items and enemies. Was Zelda called Adventure at first? I think “Adventure Mario” was written on the file binding these specifications. It’s for Zelda, but it says “Adventure Mario”? It always said “adventure.” Whether it was “Mario” or “Zelda.” On the second page, for items, it mentions compasses, bows and arrows, boomerangs, and gold and silver. It says “Bull Demon King” here. Is that Ganon? And it says “octopus.” That must be the Octorok, right? Wow… And “Eyeball” must be Gohma. That square bit at the top indicates the size of the characters. Oh, it’s two by two. So this enemy should be two by four. It includes how to actually design it from the very beginning. 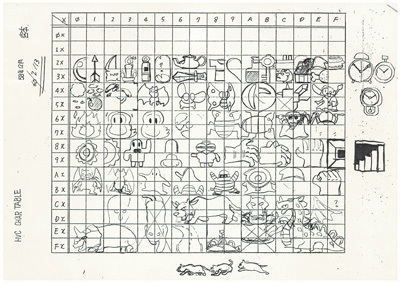 And it has notes designating things as small, medium-sized, or large. It was visualised clearly from the very start. I guess it’s designed with the functions in mind, but still, I’m surprised. These specifications were written on a white board that could be copied. Miyamoto-san jotted all this down, and then we copied it. It’s dated February 1, 1985. These are the rough sketches that came up afterward. It’s dated the same year, February 13. Not even two weeks have passed since the specs were first written on the white board. Whoa, there’s even a Blade Trap. For the first thing drawn up, it’s rather complete. Did you talk about it beforehand and build up ideas? We wrote down one thing after the next, and this was the result. The original specifications were drawn up in 1985, and here we are today still making Zelda games based upon these specifications. Was everything here used in the first Zelda game? I see things I don’t remember. No, we didn’t use all of them. We drew materials from this for quite some time afterward. You got enough ideas from it for five, ten years, I’d say. I’m surprised. Last time we talked about how the first Zelda only had dungeons. This is the planning sheet for the dungeon select screen we drew up back then. The title is “Adventure Title,” so we hadn’t decided on The Legend of Zelda yet. And that’s Miyamoto-san’s signature. 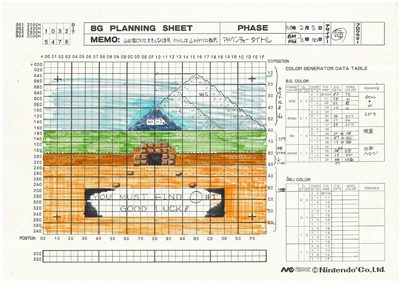 And this is the first land map of Zelda. 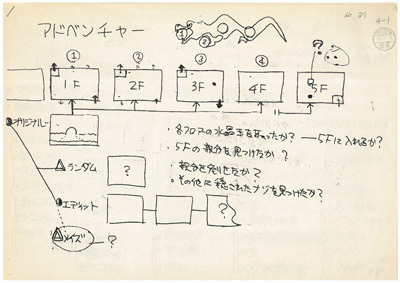 Back then we had some long paper, and Tezuka-san and Miyamoto-san would sit side by side and draw together. Yes, you did! (laughs) You drew the stuff on the left, Tezuka-san, and the right side is Miyamoto-san’s. If you look closely, you can tell how marker was used to make small dots. These are rocks, and these are trees. And you can see Miyamoto-san’s personality. At first he’s making individual dots, but as he gets tired of it, toward the top, he just fills in a bunch of space! Yeah, the left and right sides do look different. They really are different somehow. And they drew this all in one sitting. And it’s marker, so it can’t be erased. Amazing. No, we had correction fluid, so it was alright if we made a mistake. Oh, yeah, I can see where correction fluid was used. But there aren’t many places like that. Overall, it’s quite a good batting average. The Lost Woods is there, too.